Originally intended to be a feature film version of the Nickelodeon show, The Adventures of Pete & Pete, Snow Day has its roots buried well. Living in California, we never had snow days, but I was luckily able to live vicariously through this movie. Snow Day follows a group of young kids who celebrate the year’s first school closure and try to stop the “evil” snow-plowman (Chris Elliott) from clearing the roads. Meanwhile, high schooler Hal (Mark Webber) tries to woo the popular Claire Bonner (Emmanuelle Chriqui) after she breaks up with her boyfriend. The film’s moniker is that anything can happen on a snow day. Just like Pete & Pete, it’s way smarter than it needs to be or should be. Much like childhood, it’s often bittersweet. It glorifies the simple things because that’s what it’s like when we’re kids. These little pleasures are such a big deal to us, and it’s nice to see a movie that understands that. For a children’s movie it’s fully aware of itself and stays entertaining throughout without having to throw in any cheap action sequences. Though it’s still a product of its time, so it’s not without a couple of sappy moments–only one or two. Hal’s dad is played by Chevy Chase, who’s a perfect fit. And Josh Peck is a wonder here in his debut. It’s apparent early on that he has great instincts. The cast is very good all around with some solid performances that really get the job done. There really aren’t any weaknesses. Hal’s sister, Natalie, is the ring leader of the anti-plowman kids. A lesser film would have found cliches to fill out her relationship with her brother, but this one knows how to hit the nail perfectly on the head. This movie just gets it, embellishing small moments and memories as we do in our minds when we’re young, and keeping them that way even into adulthood, so we can look back at them the best way possible. Snow Day basically magnifies that sentiment and perfectly empathizes with it by making the mundane magical. Often times, longer episodes–or specials–of a half-hour sitcom series don’t work. The pacing is all thrown off and the lack of a laugh track makes the jokes fall flat. And while Two Heads Are Better Than None is a little odd at first without the studio audience, any fan of Kenan and Kel will enjoy this made-for-TV movie. It’s the same humor, minus the scheming by Kenan. This one lets the boys get into trouble all without having to scheme anything at all. Kel crashes Kenan’s family’s cross-country road trip vacation. Along the way, they encounter the ghost of a headless knight who is looking for a living soul to give him a new head. Nickelodeon’s Cry Baby Lane has somewhat of a mystique surrounding it. On October 28, 2000, Nick aired the made-for-TV movie. But after that, it was never aired again. Apparently the film got banned. Years later, talks of it swirled around the undercurrents of the internet, and finally, in 2011, the movie was shown on Nickelodeon’s TeenNick network. Why was it banned you ask? Well for starters, the film starts out with Frank Langella’s character, Mr. Bennett the undertaker, telling the tale of a farmer and his wife who gave birth to conjoined twins many years ago. Ashamed of his children, the farmer kept the them locked up in a room in his house. He soon realized that one twin was good, while the other was evil. Eventually one of them got sick and died, which was also fatal to the other twin since they shared the same vital organs. After they died, the farmer sawed the two boys in half, burying the good twin in the town cemetery, while burying the evil twin at the end of a generic dirt road in the backwoods. The road is now called Cry Baby Lane due to the sounds you hear in the middle of the night of the dead boy crying for his twin brother. Yeah, this film was banned. In the year 2000. Can you imagine what the reaction would have been like if it were released nowadays when parents are far more aware of what their kids watch? It’s a very creepy movie, and doesn’t even saturate itself with jump-scares. All of the creepiness comes from the inherent properties of the story and the visuals themselves. But I think we may not be giving kids the credit they deserve. I think they can handle it. The eerie tale of the twin boys is being told to brothers, Andrew and Carl. Andrew is played by Jase Blankfort, and he does a great job. His deliveries are so spot-on and organic that you never sense he’s acting. He’s fun to watch. The free-flowing dialogue helps his true instincts come out and he really gets a chance to show his chops. I would’ve loved if this could have been longer. At 70 minutes, it’s an unusually short film, so the pacing is all out-of-sorts. Maybe that’s why it feels just like a really long TV episode. Although never formally advertised as such, Cry Baby Lane is a feature-length version of the Nickelodeon show Are You Afraid of the Dark? With most references to the show coming from motifs in the musical score, the film does actually follow a similar tone–albeit much darker. The loose direction by Peter Lauer crosses back and forth between refreshingly unorthodox and frustratingly informal. It’s a weird movie with a lot of seemingly unrelated bits added in, making the film feel disjointed at times. There are scenes and characters that do nothing but waste time, even with the little amount it has in the first place. But on the other hand he doesn’t let simple details go unnoticed merely because this is a kids’ movie. He has characters in the film who are possessed, but doesn’t just cliche his way through it. He uses these instances as opportunities for humor and irony. At one point, a possessed mailman goes around smashing mailboxes with a baseball bat. Many of the seemingly-innocuous idiosyncrasies or nuances are given attention–for better or for worse. There’s a sort of unique humor to the film. Most of it is subtle–another very “Nickelodeon” thing about it. In fact, many of the events happen primarily due to the fact that Mr. Bennett is the world’s worst undertaker–a joke exemplified a few times. Needless to say, you don’t have to worry about this movie talking down to its audience. The subject matter alone proves that it has every bit of faith that kids can handle just about anything. I’d say Cry Baby Lane might possibly be a little too mature and scary for some kids to be watching, but rooted in its reckless storyline are ideals and philosophies of past children’s TV networking. Things that are no longer practiced in children’s television really at all. Things that used to let kids know you trusted them and didn’t think they were stupid. This might be the most important takeaway of all. Nowadays children’s television–not the least of which, television movies–are targeted to kids in a very different way. We see kids having extraordinary abilities and powers that set them above normal kids, and much of what’s available now creates unrealistic goals for the children watching it. Gone are the days where they can watch TV and see people just like them–people who dress like them, act like them, and have similar problems. Everyone’s world on TV is perfect now, which heightens kid’s expectations for their own worlds. 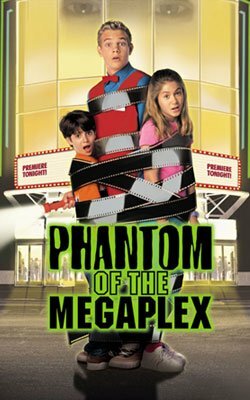 With that rant aside, Phantom of the Megaplex came out on the Disney Channel in 2000–still running off the fumes created by the ’90s children’s television boom. At that time, the Disney Channel was now a network available in non-premium cable packages and had been coming out with quite a lot of original programming to compete with Nickelodeon, Fox Kids, and the like. That year, they peaked their Disney Channel Original Movie–or DCOM–production at one movie per month–the only year to date with that frequency. The years before and after gave us 8 and 10, respectively, but compared to recent trends of releasing as little as 1 DCOM in a year, even 8 gave us plenty of options. We weren’t seeing the same couple of films all year long, and we were appreciating the ones we saw when they were broadcasted. Amidst the plethora of releases in 2000 was a Halloween-themed movie Phantom of the Megaplex, which follows a 17-year-old movie theater employee who is about to experience the craziest night of his life as the megaplex he works at is having their first red carpet premiere. Meanwhile, everything seems to be going wrong and he, along with his two younger siblings, must try to figure out who or what is causing the chaos in order to save the premiere. Within the movie, there are several “movies” talked about and shown intermittently inside the theaters. It creates its own meta world of movies within the film universe, along with acknowledging a few masterpieces of old cinema. This movie is far from being a technical masterpiece itself, but if you take it for what it is you will see a different experience altogether. It never tries to be perfect, which considering the alternative is fine by me. Once you get past the corny tendencies that were so common in low budget post-’90s TV movies for kids, you get a pretty entertaining film. The pacing is a little slow in the beginning, but carries on just fine after about 20 minutes in. It provides us with a fun mystery to solve, along with the characters, and does a good job of masking who the actual phantom is. The main issue this movie faces is that there’s never really anything at stake other than the ruining of a film premiere and maybe the fate of the characters’ jobs. Nobody’s life is threatened, or even feels threatened. It’s all just really mysterious more than anything else. Also, the motives of the person responsible for all the mayhem don’t make much sense and are brushed off once explained. But this film is filled with some really good messages and pays great homage to the classics of the silver screen, as well as to cinema in general–a theme that is seldom, if ever, delivered to this demographic. Phantom of the Megaplex sparked my own love and passion for movies when I first saw it in 2000 when I was 11. It inspired me to want to see all the classics and watching it again now helps to remind me of why I started loving movies to begin with. It’s a movie I think of often whenever I may doubt my passion. Although I feel lately that film has undergone a lot of change and while I’m not a fan of modern trends in cinema, Phantom of the Megaplex rekindles the spirit of what movies should be–magic. It romanticizes cinema for me every time I watch it, and making it available to kids now will hopefully do the same for them and make them yearn for the days gone by. “If you pay attention, movies can teach you about life.” –An actual line from a made-for-TV movie for kids. As a direct-to-video prequel to the 1999 original, most will go into watching this film with a lot of doubts. And while it does abandon a lot of the tone from the original to become more of an American Pie type of film, it gives a realistic setup to where we see Sebastian and Kathryn in Cruel Intentions. None of the actors are the same, but they aren’t terrible. In fact, Amy Adams is quite impressive given the poor script. The only problem is that this version of Kathryn is openly evil and not as undercover about it. Robin Dunne, who plays Sebastian, gives us a more likable character, but provides nothing of the same charisma as Ryan Phillippe’s portrayal of the original. I compare this film to the straight-to-DVD American Pie: Band Camp. It’s entertaining, but not the exact same. It’s more aware of itself as a film, and at times feels like a Dawson’s Creek episode–which it acknowledges once or twice. Although many may not like the twist ending, I think that it concludes an interesting backstory as to how Sebastian got to be so wicked and conniving in the original film. Cruel Intentions 2 steals a lot from the original, but also provides some more jokey dialogue and shock value–hence the American Pie type film. The jokes miss a lot of the time and are usually set up very blatantly. The plot might move a little slow and it may be low budget, but it’s not a complete waste of time if you’re a fan of the original.